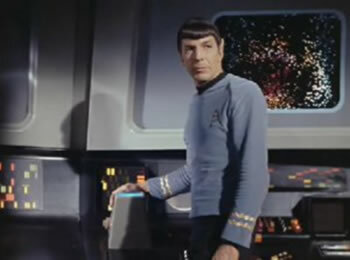 As much as I loved Star Trek in the 1960's, there were some elements of the series' pseudoscience that made me wince. One of them was the idea of a long range sensor that could detect life readings on distant planets. How could you possibly detect life at a distance of light years? It turns out that it might be possible after all. Astronomers have found a way to determine the atmospheric pressure of far away worlds using "dimers", molecules that couple to form larger, more complex molecules. In particular, two oxygen molecules. We present a new method to probe atmospheric pressure on Earth-like planets using (O2-O2) dimers in the near-infrared. We also show that dimer features could be the most readily detectable biosignatures for Earth-like atmospheres and may even be detectable in transit transmission with the James Webb Space Telescope (JWST). The absorption by dimers changes more rapidly with pressure and density than that of monomers and can therefore provide additional information about atmospheric pressures. By comparing the absorption strengths of rotational and vibrational features to the absorption strengths of dimer features, we show that in some cases it may be possible to estimate the pressure at the reflecting surface of a planet. This method is demonstrated by using the O2 A band and the 1.06 μm dimer feature, either in transmission or reflected spectra. It works best for planets around M dwarfs with atmospheric pressures between 0.1 and 10 bar and for O2 volume mixing ratios above 50% of Earth's present-day level. Furthermore, unlike observations of Rayleigh scattering, this method can be used at wavelengths longer than 0.6 μm and is therefore potentially applicable, although challenging, to near-term planet characterization missions such as JWST. We also performed detectability studies for JWST transit transmission spectroscopy and found that the 1.06 and 1.27 μm dimer features could be detectable (SNR>3) for an Earth analogue orbiting an M5V star at a distance of 5 pc. The detection of these features could provide a constraint on the atmospheric pressure of an exoplanet and serve as biosignatures for oxygenic photosynthesis. We calculated the required signal-to-noise ratios to detect and characterize O2 monomer and dimer features in direct imaging–reflected spectra and found that signal-to-noise ratios greater than 10 at a spectral resolving power of R=100 would be required. So, given that this method works (there are others), maybe Spock was right all along. From Using Dimers to Measure Biosignatures and Atmospheric Pressure for Terrestrial Exoplanets (pdf) via ScienceMag.